I’ve had the privilege of riding with Cannondale’s Cypher Helmet this season. As someone who has ridden many different helmets and products in general, I can tell you that not all helmets are created equal. The Cypher provides coverage that over achieves industry standard, and gives an incredible amount of ventilation while keeping aerodynamics in mind. While protection is the most important characteristic for a helmet, weight is also huge. Cannondale took this into consideration while designing the helmet and it is the lightest helmet I’ve ever worn. The ratcheting system used is a simple dial that works flawlessly and allows the rider to make micro-adjustments on the fly for an optimal fit. Cannondale’s Cypher is a phenomenal choice for the club rider, endurance cyclist, and the aspiring crit racer. 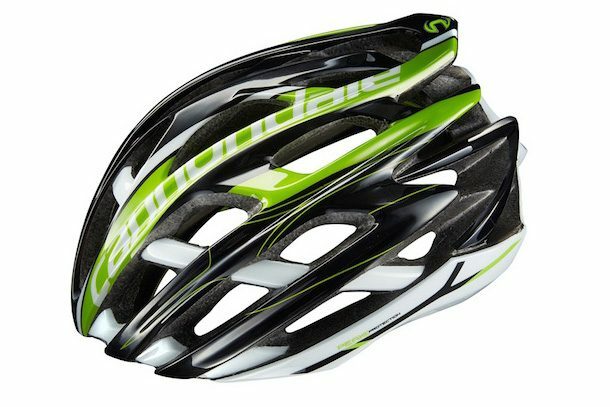 The Cannondale Cypher helmet is a super lightweight and comfortable helmet that offers awesome ventilation and superb and stylish protection. 30 flow-through vents control comfort by maximizing airflow through the helmet. Peak Protection technology uses dual-density EPS foam to reduce weight while maintaining the highest industry safety standards. A 3-position height adjustment allows just-right placement of the Ergo-fit EVA occipital pad and the micro-dial tension adjuster delivers a precise fit. The Cannondale Cypher helmet is available in many different color options. For more information on the Cannondale Cypher Helmet, please visit Cannondale.com.